Kid One Transport was founded in 1997 for the purpose of providing children and expectant mothers with access to health care services throughout the state of Alabama. We serve the tens of thousands of children and expectant mothers across our state who are considered transportation disadvantaged. We’ve traveled many miles over the years, but there are many more left to travel. We hope our mission and vision inspire you to join our cause and support the great work of Kid One as we deliver hope and healing to children and families in need. 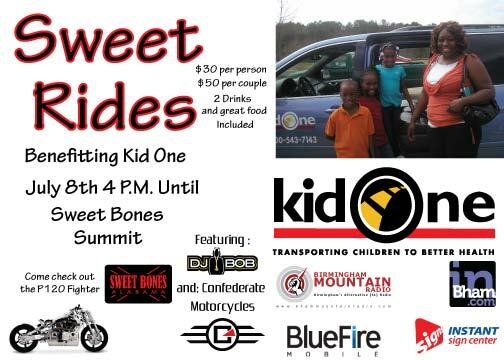 To register for Sweet Rides visit the event page here. For more information about Kid One Transport and how you may become involved please visit http://www.kidone.org/.